Ioco Ghost Town Day returns! Activities include tours of the town in Model A cars, artisan displays, pony rides, kids’ crafts and much more. This year, performers include bluegrass band 5 on a String, magician Dennis Hewson, barbershop quartet Antique Gold, and musician Nigel Tucker. Also joining us to share the history of Ioco as heritage actors are local youth from Theatrix. Come join us for this free family event at the former Ioco Lawn Bowling Green (Ioco Rd. & 1st Ave. in Port Moody). Enjoy good old fashioned fun while learning about the heritage of the former Ioco town. Free parking for both events is available along 2nd and 3rd Avenues in Ioco. For directions to the event, use our Map to Ioco. Ioco Ghost Town Days is organized by the Port Moody Heritage Society who owns and operates the Port Moody Station Museum. Ioco Days is supported by Heritage Canada, the Port Moody Heritage Commission, Impact Canopies, Freybe Gourmet Foods, and Pacific Coast Terminals. Despite the not so sunny weather the Canada Day Weekend was a great success. The crowds gathered to watch the Greater Vancouver Garden Railway Club while they displayed their model trains on Sunday as the melodies of Larry Yan’s flute floated across the grounds. The Family Days that lasted from Saturday to Monday were popular as well with the kids building lanterns and searching around the museum finding clues for the scavenger hunt. On Monday Joanna Wang played the traditional stringed instrument called the “Erhu” as Benjamin Wang taught visitors how to play the strategy game of “weiqi”. The fun is not over as these Family Fun Days will continue every Sunday, 11am to 4pm, until the end of August. Crafts and the scavenger hunt will be happening throughout the day and be sure to keep an eye out on the events calendar to see who our special guests will be each Sunday. Come join us at the Station Museum this Sunday to see the Greater Vancouver Garden Railway Club (GVGRC). The display includes working model steam engines and a model Thomas the Train display. Joining the GVRC at the museum will be the Morse Telegraph Society as they teach visitors all about the telegraph and the basics of Morse Code. Throughout the Canada Day weekend visitors can enjoy our Family Days in conjunction with our feature exhibit “Chinese Legacies”. Activities include lantern making, spike driving, a scavenger hunt and two musicians. On July 1st, from 11am to 1pm, Joanna Wang will be playing the Erhu, a traditional Chinese stringed instrument , and from 1pm to 3pm Larry Yan will be playing a series of traditional Chinese flutes. For more information on parking and costs visit our “What’s On” page. See you on the weekend! This October marks the 10thanniversary of Ioco Ghost Town Days. Begun as a celebration of the establishment of the former Ioco town site as a designated heritage area, the event celebrates the heritage of the former Imperial Oil town site and the people that lived there. Come join us for this free family event at the former Ioco Lawn Bowling Green (Ioco Rd. & 1st Ave. in Port Moody). 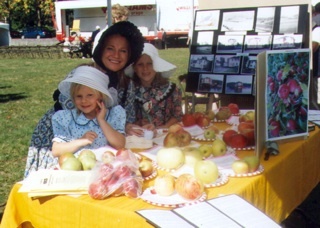 Visitors will enjoy good old fashioned fun while learning about the heritage of the former Ioco town. This year, Heritage Society has organized a two day event on October 1st and 2nd. On October 1st current and former Ioco residents will reunite between 1 and 4pm to reminisce and enjoy our heritage photo display, some jazz music and refreshments. On October 2nd, the big show will return with ten different musical, dramatic and variety acts, tours of the town in antique cars, artisan displays, pony rides, kids’ crafts and much more. Click HERE for more details about and directions to Ioco Ghost Town Days. Ioco Days is supported by Heritage Canada, the Port Moody Heritage Commission, Impact Canopies, Freybe, Pacific Coast Terminals and Thrifty Foods-Suter Brook. Another fruit we grew in our garden last year was the citron melon. 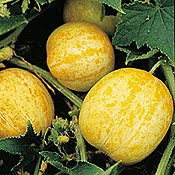 At one time this melon was widely grown in Canada and was a popular fruit because it was so flavourful when eaten fresh. Citron has a tough outer rind and will keep for several months indoors – even at room temperature. I kept mine in the basement from late Sept. until early Jan. and they did not go bad. Note that the Citron Melon is not related to or anything like the Citron Peel you can buy in the store. So what to do with Citron Melons? The solution was to make some preserves. When I started I found out just how tough the rind was and needed a carving knife. 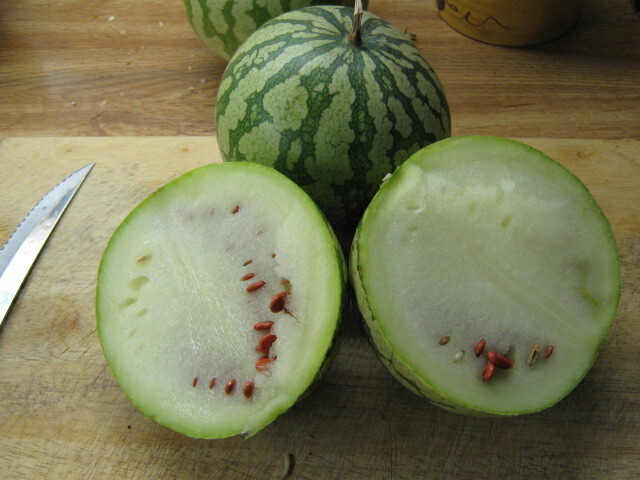 Once cut open, the melon has red seeds evenly distributed throughout the fruit. It took some time to remove the seeds and cut the melon into bite size pieces. 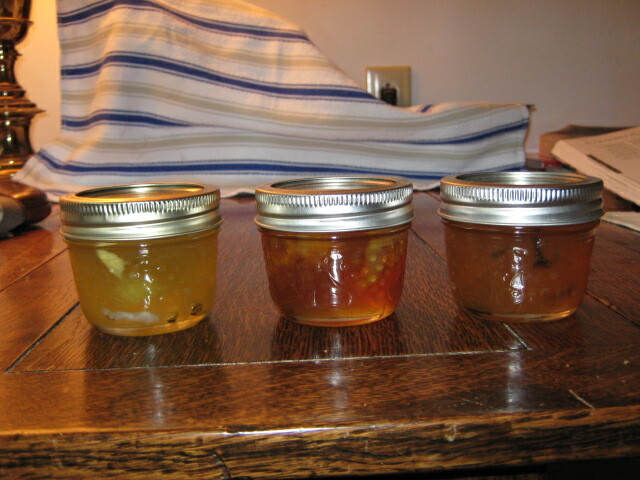 Recipe 1 – treated the citrons like pickles. 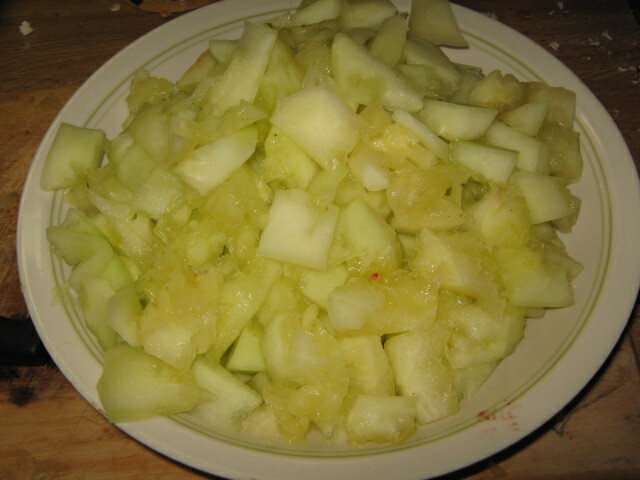 The melon pieces were soaked in brine for a day and drained and rinsed several times. Then they were boiled in a mix of sugar, lemon juice and lemon pulp with ginger root. The end product was a nice yellow colour with chunks of solid fruit. Recipe 2 – The melon pieces were boiled in a mix of sugar, lemon juices and ginger root and toward the end crushed pineapple was added. This mixture carmelized quite a bit and did not have many chunks of fruit – everything was reduced to a pulpy mass. Recipe 3 – Again the melon pieces were treated like pickles as above. After this they were boiled in a mix of sugar, cinnamon stick and cloves. This made for quite a different flavour. Because citron melon has so much pectin in it, all these products are very thick and have a firm set. Come by on Sunday, May 9th to sample these products at our annual Mother’s Day Tea! During 2009, we grew many interesting vegetables in our Heritage Garden. Much of it was donated to our local food bank (they were often intrigued by our unusual harvest). Two of the foods we grew were popular 60-100 years ago but we rarely see today – lemon cucumbers and citron melon. Here is a picture of the lemon cucumbers. They tasted like cucumbers and were rather seedy but looked more like lemons. It turned out that the vines were quite productiv e and since we harvested so many, it was possible to make some pickles with them. The pickles turned out yellow but I think it was because of the tumeric. Here is a picture – oops, I ate some! They are a bread and butter type pickle and kind of sweet in flavour. We are now planning our garden for 2010. If you are interested in volunteering contact Rebecca at pmmuseum@telus.net. Do you have leftover pieces of ribbon, lonely buttons or other odds and sods around your house? The Museum is looking for donations of these items to use in our pumpkin decorating and /or clothespin dolls crafts. If you have items you would like to donate, please bring them to the Museum Monday – Friday between 9:30am and 4:30pm or Saturday and Sunday between noon and 4pm. Join us for some free family fun. Recapture the spirit of the past at the historic Ioco town site. Activities for all ages. Listen to 50s jazz and enjoy a variety show. Try your hand at horseshoes and lawn bowling. Bake and bring the prize winning pie or sample BC grown apples. Kids can decorate and take their own jack o lantern, make a heritage craft or play heritage games. Lots to see and do at this community event.